Backlog has been upgraded lately. With this update, the following functionalities are added. 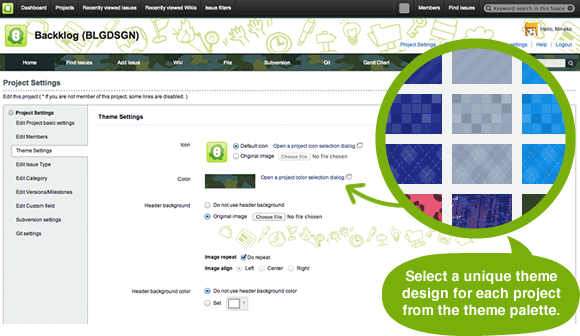 In this latest Backlog update, we've added an array of theme designs that you can personalize your projects with. Select from simple solid colors to funky leopard prints, aztec designs, or even fierce camouflage prints to add some gusto to your projects! Not only do project themes let you add a splash of fun to your work, they also help you identify different projects more smoothly and quickly. Go ahead and try it now! In response to the wildly popular request from everyone, we have created the subtasking function on Backlog. Easier tracking of task delegation and progress. Smoother management of large projects for project leaders. Collective view of related issues. To begin using the subtasking feature, the Space administrator simply needs to check the "Enable Subtasking" box on the Project Settings page. Project managers and team leaders can easily get an overview of all project development by filtering the search for parent issues only. Organize and manage enormous issues by breaking them down into smaller, more specific individual issues that can be assigned among multiple people and tracked independently. Eliminate the inefficiency in tracking long threads of comments and changes cramped into a single huge issue. The subtasking function is here to streamline your work and team processes. 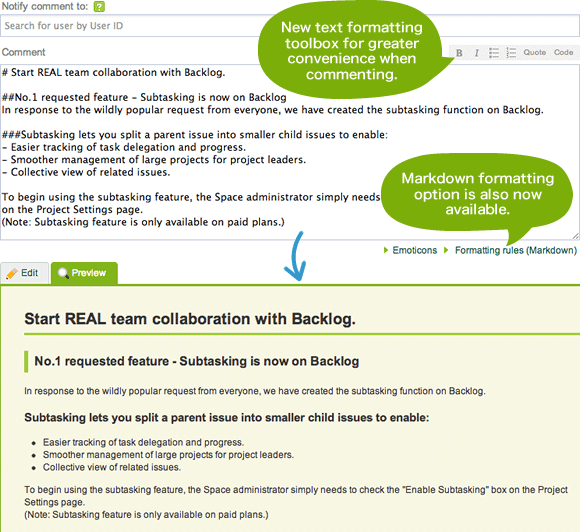 Good news for web authors and software engineers, you can now use Markdown formatting for wikis and issues on Backlog. The simplicity of the Markdown format creates less room for errors, and helps make your work easier to read and more portable. We are going to add features requested and improve Backlog even more in the next update. Please enjoy using Backlog and look forward to hearing future updates!